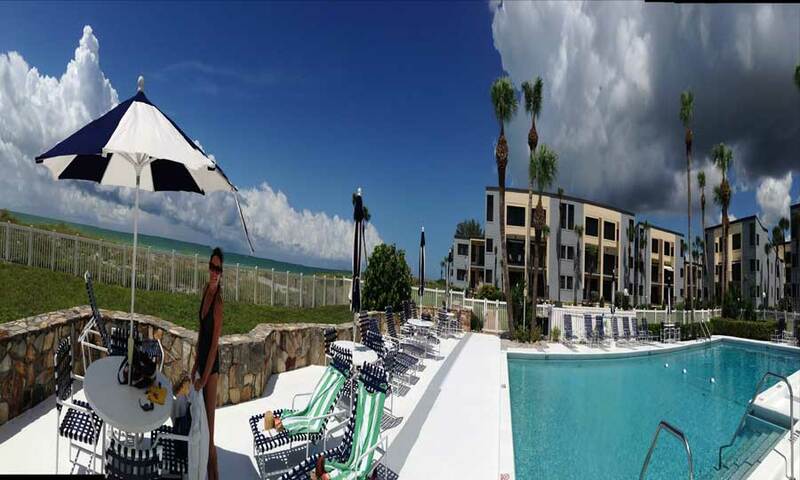 MacArthur Beach and Racquet Club is a gated condominium community situated directly on the Gulf of Mexico. The community is located on the Island of Venice in Venice, Florida, half-way between the Venice Municipal Fishing Pier and Venice Public Beach. Condo units at MacArthur Beach are highly coveted for their location and beautiful panoramic views of Venice Beach. The complex is maintenance free and has an association fee which provides for common area maintenance, outside maintenance, trash, water, sewer and basic cable. In addition, the complex has recently completed a $1 million renovation. We are a people friendly, beach living group who treasure our location on Venice Beach. Units average from 900 to just over 1300 square feet and covered parking is available. MacArthur Beach has lovely amenities including the soothing waters of the Gulf of Mexico, swim-bys by dolphins and manatees, beautiful sunsets, and sandy beaches. Residents can enjoy private beach access just steps away from their front door, a heated community pool, and a community clubhouse complete with a kitchen. The heated pool is encompassed by a beautifully landscaped courtyard and also has a view of the gulf. Tennis courts are also available for enjoyment of residents and guests. Other activities like fishing, swimming, boating, or sailing can be found in the nearby city of Venice.